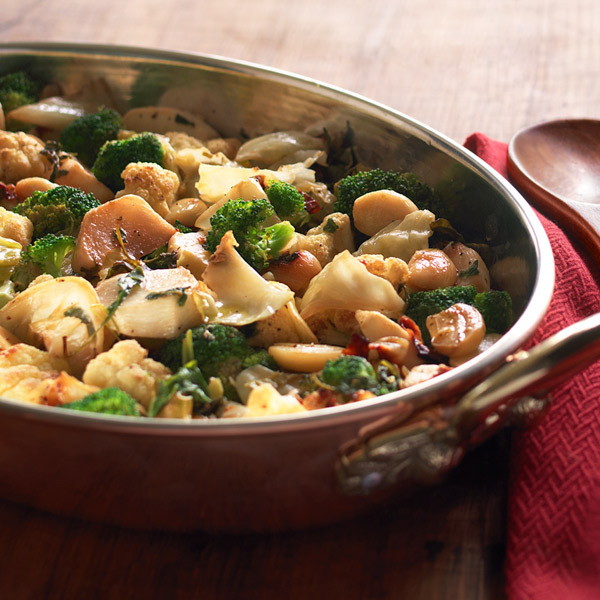 Broccoli, cauliflower, turnips, garlic, shredded arugula and cabbage combine in this rustic Roasted Vegetable recipe. A blend of Dijon mustard and olive oil enhances their fresh-picked flavors, making these oven-roasted vegetables a perfect side dish for your favorite beef, pork or chicken recipes. Separate the broccoli into small florets and stalks. Cut the stalks into ⅓ inch slices. In a large bowl, combine the broccoli, cauliflower, turnips, garlic and arugula. In a small bowl, whisk together the oil, mustard, ½ tsp. of the salt and the pepper. Spoon about 2 Tbsp. of the mixture into a large roasting pan. Place the cabbage on top of the oil. Add the remaining oil mixture to the vegetables in the bowl and toss to coat evenly. Transfer to the roasting pan and place on top of the cabbage. Cover the pan with foil and roast for 35 minutes. Uncover, stir gently, and roast for 20 minutes, stirring once halfway through, or until the vegetables are tender. Sprinkle with the remaining ½ tsp. salt and transfer to a serving bowl.